We no longer carry the 1989-95 Mustang Abaco Mass Air Meter To Factory Harness Adapter 5.0L. Wanting to use an Abaco Mass Air Meter on your 1989-95 Ford Mustang 5.0L? Don't forget your adapter harness for an easy plug and play install! This is an Abaco mass air meter adapter for your 1989-1995 Ford Mustang 5.0L. It will be needed in order to run an Abaco mass air meter. 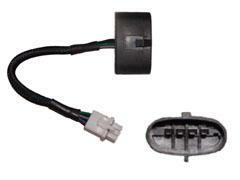 It is an easy plug and play installation to your 5.0L engine harness.